Pro Dive Mexico PADI Career Development Center: Pro Dive Mexico - An award winning company! Feedback/questions/activities/discussions for scuba professionals looking for a PADI Career Development Center in Mexico/Caribbean. From Novice divers to Full PADI Instructors with our GoPro Packages. 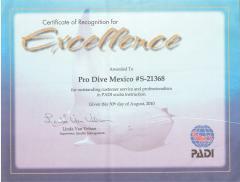 Pro Dive Mexico - An award winning company! I wanted to take this opportunity to congratulate you and Pro Dive Mexico on your recent nomination at DEMA for the "PADI Americas Overall Oustanding Achievement Award". On behalf of everyone here at PADI, I would like to extend a hearty congratulations on a well-deserved nomination! Thank you for your support and keep up the great work! To explain, PADI Americas will every year nominate 3 members only, for each category of excellence out of their whole region, being North America, Central America & South America. Pro Dive Mexico has been nominated in not only one, but two categories! Only the best out of these best, meaning the ones that are nominated for several and not only one award, will then be nominated for the OVERALL Oustanding Achievement Award. Winning this one, therefore comes equal with being awarded to be THE BEST of all. So there you have it! We not only say we are the best, we really are! And we are really proud, to have achieved these recognitions. Once again, we are proud to say there is no better choice for you in the Americas to become a PADI instructor. Do it with Pro Dive Mexico Scuba Academy! The only PADI CDC center in mexico, and one out of three only in Latin America. Our course director Anders Heegaard received the PLATINUM COURSE DIRECTOR award, being one out of only a handful worldwide. Winner of certificate of recognition for excellence, for outstanding customer service and professionalism in PADI scuba instruction in 2010. Recipient of the NATIONAL GEOGRAPHIC dive center award, for 7 consecutive years since 2005. Nominated by PADI Americas: Outstanding Achievement Award for Instructor Development in 2010. Nominated by PADI Americas: Outstanding Achievement Award for Dive Resort Business in 2010. 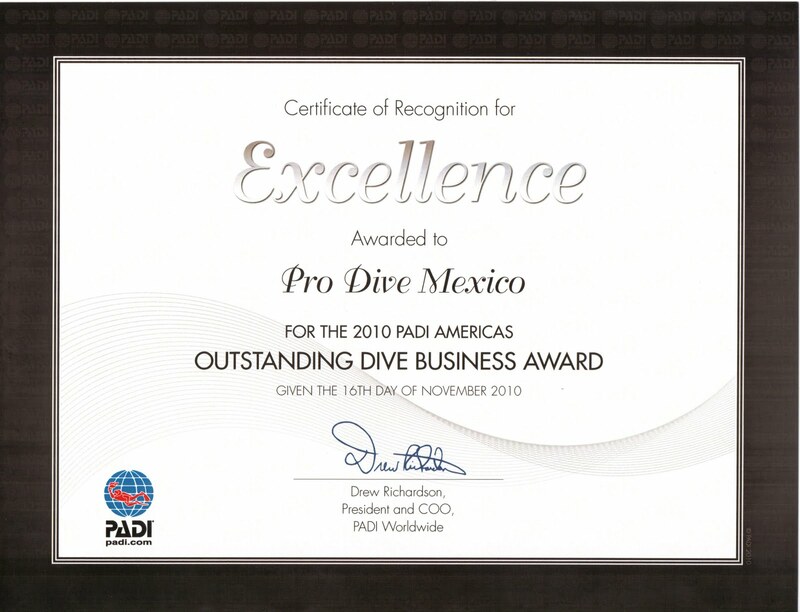 Nominated by PADI Americas: OVERALL Oustanding Achievement Award in 2010. Become a PADI Instructor with Pro Dive Mexico Scuba Academy. Don't settle for less, because you deserve THE BEST. We are a 5 star IDC/CDC centre in Mexico, specializing in professional diver career & education. Come join us at the Scuba Academy and become a DIVE PRO! April IDC and great weather. 100% passing rate at the PADI Instructor Exams!